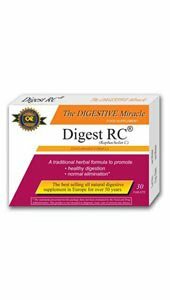 Digest RC® is a multiple herbal extract formulation that promotes the release of bile from the liver to speed digestion of fats and protein and prevent stagnation of food in the digestive tract. It thus helps relieve a feeling of fullness and bloating and aids in gastrointestinal health. This formula is particularly beneficial for those who have not responded to food elimination therapy and those with digestive problems typical of aging. DIRECTIONS: 1 to 2 tablets before meals as needed.